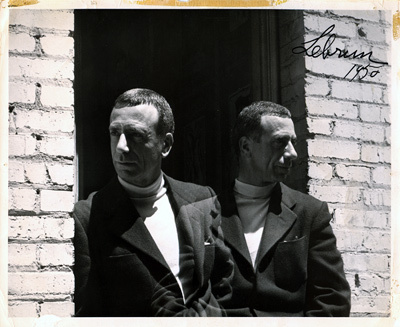 A double-exposed self-portrait of Rico Lebrun given to fellow artist Morton Traylor in 1950. Frederico (Rico) Lebrun was born on December 10th, 1900 in Naples, Italy. His formal art education consisted of attending technical school and art classes at night, studying the Old Masters in museums, and assisting fresco painters. He was profoundly influenced by both Italian and Spanish art, Naples having been ruled by Spain almost continuously from the mid-16th to the late 18th century. His admiration for fresco tradition, his preference for ambitious subjects addressed on a grand scale, and the baroque sweep of his style all reflect the heritage of Italian art; his high seriousness of purpose, as well as a certain preoccupation with tragedy and death, can be attributed to the influence of Spain. Alongside the always-powerful influence of Michelangelo, he maintained a lifelong affinity for Goya and Picasso. Lebrun immigrated to the United States in 1924 to design stained glass in Springfield, Illinois. The next year the artist settled in New York, where he built a successful commercial art practice as a fashion illustrator and advertising artist. By 1930, Lebrun was prosperous, but dissatisfied. He abandoned his business and entered the field of fine arts. After a move to Southern California in 1938, Lebrun taught at the Chouinard Art Institute and then at the Disney Studios, working with animators on the figure of Bambi for the forthcoming feature film. 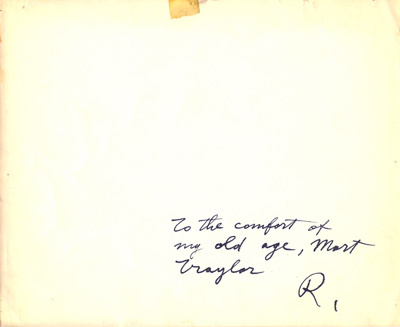 In 1935 he received a Guggenheim Fellowship for his first mural project; in 1942, he exhibited in "Americans 1942" at the Museum of Modern Art in New York. His work appeared in group exhibitions at New York's Whitney Museum of American Art and the Metropolitan Museum. 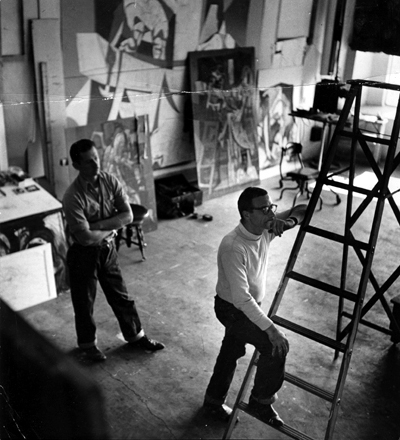 Rico Lebrun and Morton Traylor working on the Crucifixion triptych in 1951. In 1947, Lebrun became master instructor at the new Jepson Art Institute in Los Angeles. He was a charismatic and popular teacher, frequently lecturing to standing room only crowds. From 1947 to 1950, his style becoming increasingly abstract and gestural, Lebrun also worked on his ambitious Crucifixion cycle, now in the Syracuse University collection. By the end of the decade Lebrun had garnered a considerable reputation on the West Coast, both as an artist and as a teacher. In 1952, the artist left Southern California for Mexico, where he taught at the Institute of San Miguel de Allende. After briefly experimenting with formal abstraction there, Lebrun returned to Los Angeles in 1954 and resumed his prior interest in the human figure, beginning a series of drawings and paintings to memorialize the victims of the Holocaust. In 1958, Lebrun taught at Yale and the next year served as an artist in residence in Rome. When he returned to Southern California in 1960, he began working on the Genesis mural at Pomona College. Lebrun then worked on a smaller scale after the mural's dedication in 1961, making drawings and prints for Dante's Inferno. Becoming ill with cancer in 1963, Rico Lebrun died on May 9th the following year at his home in Malibu.